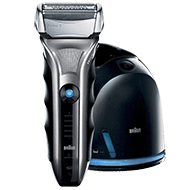 If you like the convenience of having a men’s shaver and a cleaning and charging station, but not the high cost, the Braun Series 5-565cc men’s shaver system is worth having a second look at. The Braun is a foil style men’s shaver with a black easy grip plastic casing. It has finger indentations in it to make it easier to hold. The on/off switch on the Braun shaver is a blue and black circular button on the front middle of the device. The cleaning and charging station is made from black plastic, with a blue stripe along the bottom. The shaver fits head facing down into the unit. This men’s Braun shaver is built with ActiveLift technology. 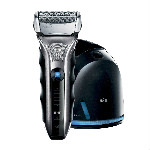 Most men have pesky hairs that lay flat against the skin and can resist most brands of electric shavers. But with this special technology, the shaver’s blades will gently lift up these troublesome hairs, and then snip them off effectively, all in one pass. Problem areas will be a thing of the past. The foil shaver head of the Braun Series 5-565cc is also contour adaptive, so it will shave a man’s face, jawline, and chin region effectively, no matter the angles. The blades within the foil of the Braun Series 5-565cc shaver feature a triple action cutting system—each set shaves progressively closer to the skin. It will only take one pass to shave effectively. The final Optifoil blades will give you the best and closest shave ever. The cleaning and charging station takes clean and renew refills. These are made from denatured alcohol, which is perfect for disinfecting the head of the shaver, killing bacteria, and ensuring that you don’t get any facial infections from shaving that can cause redness and irritation. After you place the shaver head down into the unit, all you have to do is touch a button. This unit will automatically start cleaning, charging, and lubricating your shaver. This keeps it like new each and every day you use it. There will be no need to scrub it out with a tiny brush. There are also three different cleaning programs on the unit, so you can choose exactly which one you need, whether you just need more power, or you need to fully clean it. If you’ve forgotten to charge your shaver up the morning before, the quick five minute charge feature will give you enough power for one morning shave. There is a pop up trimmer on the back that slides up or down when not in use. It’s handy to trim moustache, sideburns, or around a beard. 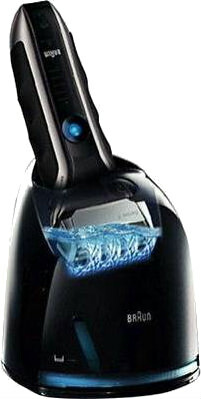 On the front of the shaver is a droplet, with an LED light below that. When this lights up, it means that it’s time to clean it. Some men prefer to clean it every day, while others prefer to do it the recommended every 3 or 4 days. But if you forget, the shaver will remind you to do it. 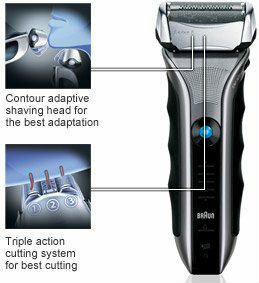 The shaver will also remind you that it needs to be charged up and placed into the unit. In the box you’ll receive one Braun Series 5-565cc shaver, three clean and renew refills, a travel case, an electric cord, instruction manual. and the cleaning and charging unit. It also comes with a two year limited warranty. Reviews on the Braun shaver and charging station are high, about 4.5 stars out of 5. Braun is a quality manufacturer of men’s shavers, and most of their products are still made in Germany, just like this shaver is. 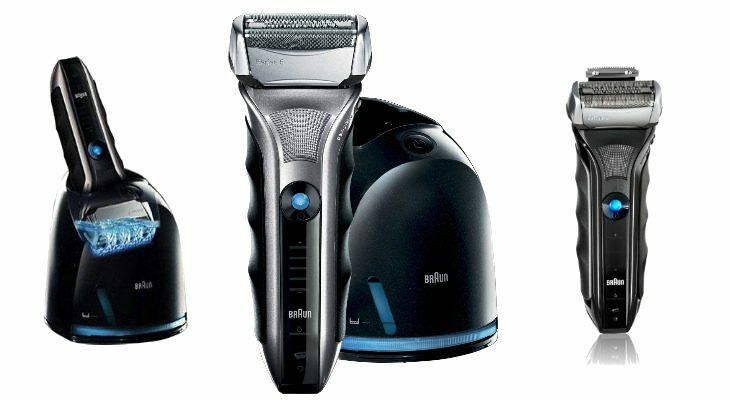 The $100 price tag of the Braun Series 5-565cc shaver makes it affordable for most men to own, and is also a great price point for men who love the convenience of the cleaning and charging unit, but who don’t like paying a high price for it. 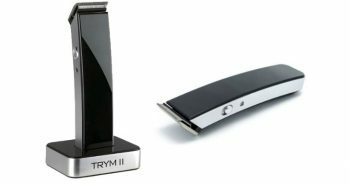 Men also have the benefit of buying a product made in Germany, rather than made in China, and for those who prefer a foil style shaver, rather than the rotary style, they’ll be able to appreciate how well this men’s cordless and rechargeable shaver will make shaving in the morning a lot simpler.